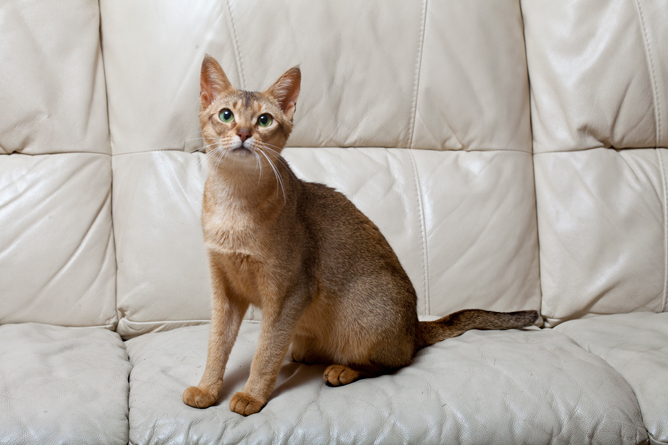 Abyssinian cat - complete breed information and advice. Abyssinians love an audience and are more than happy to take centre stage. Cheeky, playful and inquisitive yet loving and friendly - the Abyssinian is a cat of two halves! They love to play, and also love snuggling up with their owners on the sofa in the evening - and you can guarantee that if you pop off to take care of any household chores, there will be an Aby-shaped shadow behind you to make sure they don't miss out! Lynda Ashmore, vice chairman of the Abyssinian Cat Association, says: "Abyssinians are very intelligent and inquisitive so like to be involved with whatever their owner is doing. They like to 'chat' and know exactly how to get their owners' attention. They like to be busy, remain playful throughout their lives and will often learn to retrieve." Carole Jones of the Abyssinian Cat Club agrees: "The Abyssinian is, almost without exception, extremely affectionate, very active and intelligent, and insists on 'joining in' with domestic chores and gardening! It is part of their nature to be a full member of the family and the more affection they receive, the greater their response in return. "Abyssinians are extremely affectionate and in the opinion of almost all owners, there is nothing like an Aby to share your life with - or maybe they will allow you to share theirs!" Be prepared to have a conversation with your Aby as they will chat to you, with more of a sweet little 'trill' than a blood-curdling yowl! Abyssinians are very much 'people cats', so wouldn't appreciate being left for long periods of time, as Lynda explains: "Abyssinians are generally best kept in pairs or with another animal. This is particularly important if being left for long periods of time while an owner is at work. Plenty of toys and a tall scratch post or climbing frame to entertain them would also be beneficial." And what about the great outdoors? "Abyssinians are very intelligent and independent animals who like exercise and enjoy spending long periods outdoors. Due to their stunning physical appeal and their safety, an enclosed escape proof garden is the ideal," recommends Carole. It used to be thought that the Abyssinian originated from Egypt as comparisons have been made to Ancient Egyptian cats, and it is known that the Romans brought cats from Egypt to England - they certainly bear more than a passing resemblance to the cats depicted in ancient papyri and tomb paintings. Others believe that the Aby is a descendant of the African Wild Cat. Like the look of Egyptian cats? Read our Egyptian Mau cat breed profile. Abys were officially first recorded in Britain in 1882. One of the first was Zula, who was brought over from Abyssinia (now Somalia) in the 1860s by army officer Captain Barrett-Leonard. Although the exact origins of these fascinating felines is unknown, they have been in the UK for well over 100 years and were documented in the first Standard of Points published by Harrison Weir in 1889, and by Frances Simpson in 'The Book of the Cat', published in 1903. This makes the Abyssinian one of the earliest breeds of pedigree cats. The Abyssinian comes in a wide variety of colours, including usual - the most common colour - sorrel, blue, chocolate, lilac, fawn and silver, and all of these colours can also be found in the silver variety. "For most people the Usual Aby, with its wild look resembling a miniature puma or lynx, defines the breed and is very striking, but this is only one of many colours now available," explains Carole. The Abyssinian is a medium-sized cat of foreign type, medium in size and build with a lithe, muscular body, and with a distinctly ticked coat which should show four bands of colour, Their beautiful, expressive, almond-shaped eyes are either amber, green or hazel and their soft coats are fine and close-lying. If you like the look of the Abyssinian, you may also like the Somali cat breed. Abyssinian cats are hailed as being intelligent, cheeky, playful and inquisitive. As well as being very talkative with their bird-like gentle trilling, they are super smart, and love fetch and retrieve games. Whatever you are doing they will enjoy doing it with you. They make great companion cats and are extremely affectionate. They like to be made to feel part of the family. Be prepared to travel and wait for a kitten of a certain colour as Aby cats are not as numerous as you might think. In addition some colours are quite rare so if your heart is set on a particular colour, again you may have to wait. As with all kittens, make sure yours is bright and lively with clean eyes and ears, and make sure their mum is present when you visit. Abyssinians will make lovely family pets as long as they have been raised from a kitten in a family environment. Lynda says: "Prices vary around the country and some breeders will have a price for a show cat or pet and another for a breeding animal, but around £450 would probably be average." This breed is generally healthy and is not known to suffer from any inherited diseases. Abyssinians don't have any special requirements in the way of grooming as their coats are beautifully fine - a weekly brush to get rid of any loose hairs will suffice, and they will enjoy the quality time with their favourite humans. Make sure eyes and ears are clean, and a trim of their nails from time to time will keep them in top shape. They tend to like exploring outside and are adept at climbing and hunting. After owning and breeding Abyssinians for over 20 years, Jane and Dave Tompkins decided to take a break - but it only took one cat-less week for them to miss this cheeky breed! "We had our first Abyssinian in 1990; her name was Taz and she was a blue Aby," explains Jane. "My husband Dave was always a dog person and eventually he gave in and said we could get a cat, so we went to a cat show. He saw an Aby in a pen and said that's his kind of cat. We looked into the breed and they sounded ideal, so we found a breeder and bought Taz. She was lovely and followed Dave everywhere! "We bred Abyssinians on a small scale for a few years, and ended up with quite a few cats. We could never rehome our retired breeding queens; when they've been your family pet we didn't like to rehome them just because we weren't breeding from them anymore. We had 10 at one point! Gradually we let them pass on in their own time, and then last year our final Aby died and we decided not to have any more. But after a week or so, the house was too quiet and empty, especially with Abys as they follow you everywhere. If there's two of you in the house in separate rooms they run back and forth between you, yelling at you for misbehaving! "We decided to give something back by giving a home to a cat who needs it. We thought we'd maybe end up with a retired, older Abyssinian but we ended up with four-month-old rescue kitten Taji! His name means 'silver coloured' in Japanese which we thought was quite apt. When we went to collect him, Taji immediately sat up with his tail in the air and purred as if to say 'Oh, you've come for me?' and as soon as we got him home he explored straight away - it seemed as though he accepted us as his new people, and lay on our laps purring. "He's absolutely nuts and really active, but quite well behaved and he knows quite a few words, including 'no'! Taji has phases where he runs at top speed all over the house, up and down the stairs, until he throws himself down on his side, panting and exhausted! They are very active cats who need to be into everything you do; if I'm working at my computer, Taji will try and lie on my keyboard and if we're reading the paper, he'll drape himself across the pages! He loves playing with ping-pong balls and carries them all over the house, and you have to throw them for him and he'll bring it back to you. They are very loyal cats and love their owners, they will look at you with an expression that says 'I love you'.